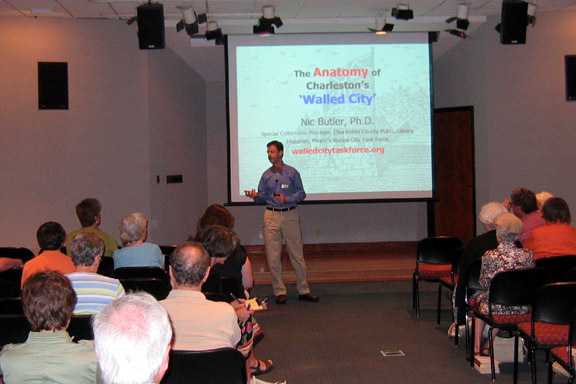 Thank you to everyone who attended Saturday’s program, “The Anatomy of Charleston’s Walled City.” Based on the numerous questions and positive comments received afterwards, I feel confident that the audience left with a better understanding of the materials and design principles used to build the defensive walls that surrounded colonial Charleston. I hope all 72 of you in attendance found it an educational and entertaining way to spent the afternoon.On Saturday, I was also pleased to make two new public announcements on behalf of the Task Force: first, the availability of this new website, and second, the upcoming archaeology to be done at South Adger’s Wharf (see the 14 September posting by Katherine Saunders). 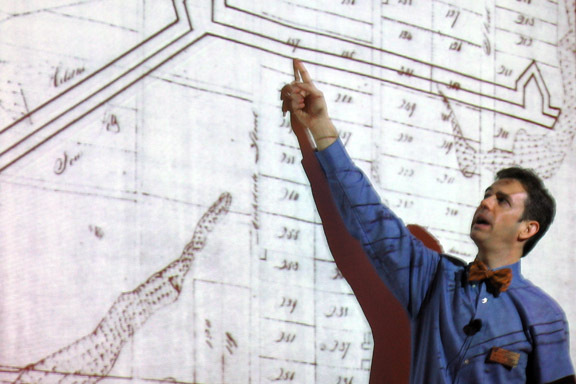 We sincerely hope that this electronic forum will help us raise awareness of Charleston’s colonial fortifications and encourge the public to learn more about this fascinating topic.For those of you who weren’t able to attend on Saturday, I’ll be repeating the program on Monday, 29 October, at 7:00 p.m., in the Auditorium of the Charleston County Public Library. Reminders of this event will be posted in advance of the program, of course.If you have questions about the program, you can contact me at the Charleston County Public Library Special Collections Department at butlern[at]ccpl.org or call (843) 805-6968. I really enjoyed your presentation and I learned quite a bit more about the fortifications. Sorry that I could not stay to hear others’ questions. I look forward to hearing more about the Walled City.